﻿Tacca nivea white, the white bat flower, with very showy white flowers which stand upright with the petals spread to the extent, in a bat-like form. The flowers appear in summer and are carried in racemes of up to 30 blooms. 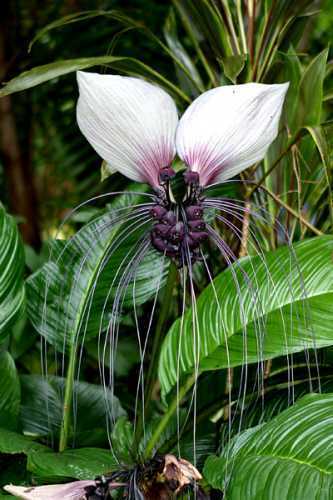 Tacca nivea's peculiar whiskers are filiform bracteoles which hang down from the flowers and are up to 35 cm long.